I was planning on answering some readers’ letters this morning, but this headline demands my attention. 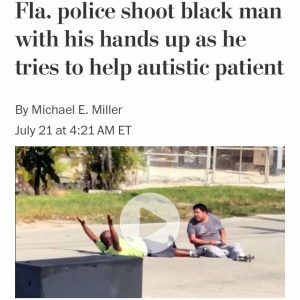 A man who identified himself to the police as a behavior therapist, laying on the ground with his hands up, is shot by the police while attempting to get his young adult client with autism out of traffic. And then, after shooting him, the police put him in handcuffs and leave him lying on the ground until an ambulance arrives. “Why they shoot the black boy [the therapist] and not the fat boy [the young man with autism, who did not have his hands up, and in fact was engaged in mild verbal aggression]?” the first asks. “Because the thing with the blacks,” the other onlooker replies. I am 68 years old – old enough to remember the birth of “live, on the scene” network television news, a technology that coincided with the Civil Rights movement of the 50s and 60s. I still carry the mental image of Bull Connnor’s water cannon and German shepherds, the Freedom Riders’ busses burning, and George Wallace defiantly barring Blacks from the campus of the University of Alabama. Thanks to the cameramen who shot that footage, Americans everywhere were able to see what was happening. Now we are all cameramen. Of the million and one things that law enforcement officers do each day, 99.99% are admirable, decent, or just plain boring. A few – even though they will never make the national news – are heroic. It’s their job. Then there are events like this. There are those who will blame President Obama (who, in their view, “hates police”, and therefore is to blame for putting police officers at risk and on the defensive (although it’s hard to see how shooting a man who is sitting on the ground with his hands in the air qualifies as a defensive maneuver). And there are those who will see in this episode distant reflections of Emmet Till and all those who before and since who met with a similar fate. A few days ago, President Obama called a conference at the White House, pulling in leaders of law enforcement, and Black activists, and civic and religious leaders to sit down around a table and start talking to one another. We need more of that, and we need it badly.